Ever since the Crocodile Dundee movies as well as the popularity of Steve Irwin's Australia nature show (Crikey, that is a mighty big Croc.") we have been fascinated by the unique experience offered by Australia. In 2016 we had the privilege of hosting a small group aboard Celebrity cruise line that sailed the coastline of New Zealand completing its journey on Sydney. From their we "soldiered on" exploring areas around Sydney, Ayers Rock, Alice Springs and Cairns. ​No matter where you travel in Australia, including the Outback, the land is teeming with unusual life. In Cairns we encountered very large bats with fox faces, to small herds of Kangaroos near Ayers Rock, observed very poisonous snakes in Alice Springs, got close to a Tasmanian Devil in Sydney. ​half day or longer snorkel experience to the Great Barrier Reef, and an Outback fly over. That is just the beginning; be sure to contact us for more Down Under insights. ​unusual, mountainous, inviting, exciting and memorable readily come to mind. These two islands, while tracing their heritage back to the Maori people of Polynesia, remain separate and distinct from its large neighbor Australia. While both countries were "settled" by the English and while some of those customs remain, "Kiwis" truly love their pristine land and are very fussy about who tries to locate to their homeland ..... including Aussies, Yanks, Brits, etc. 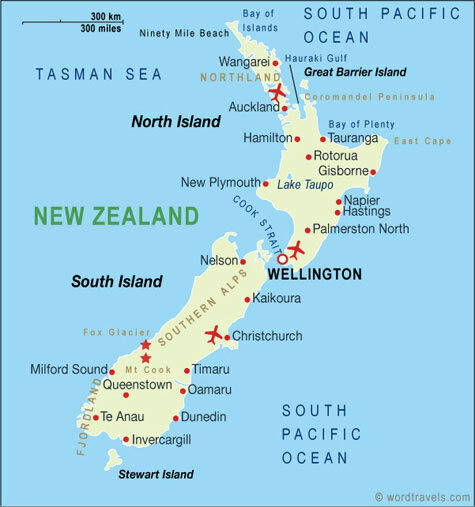 ​New Zealand is a land of extremes with glacier that extend from mountain tops to fjord laden coastline of both islands.